Excerpt: "The Jim Garrison Files"
Mr. Floyd Riebe's testimony provided to the ARRB. 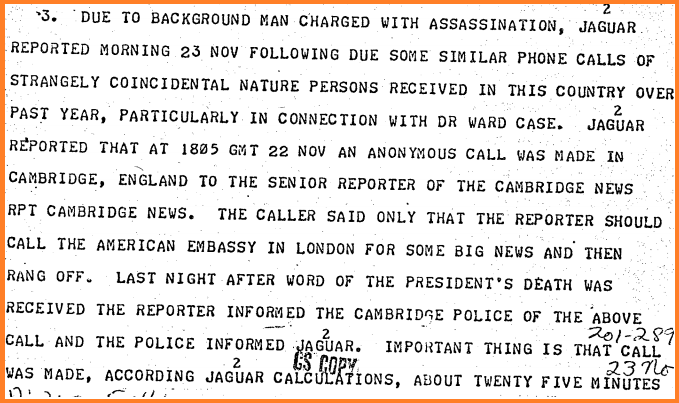 While yesterday’s pre-planned release of JFK files was significantly neutered at the request of the CIA and FBI, enraging Lou Dobbs among others, the 2800+ files which were released have been poured over extensively, revealing evidence of a second shooter, a massive CIA infiltration of the MSM, a tipoff phone call received 25 minutes before the assassination, and Soviet intelligence indicating the assassination was a coup involving LBJ among other things. 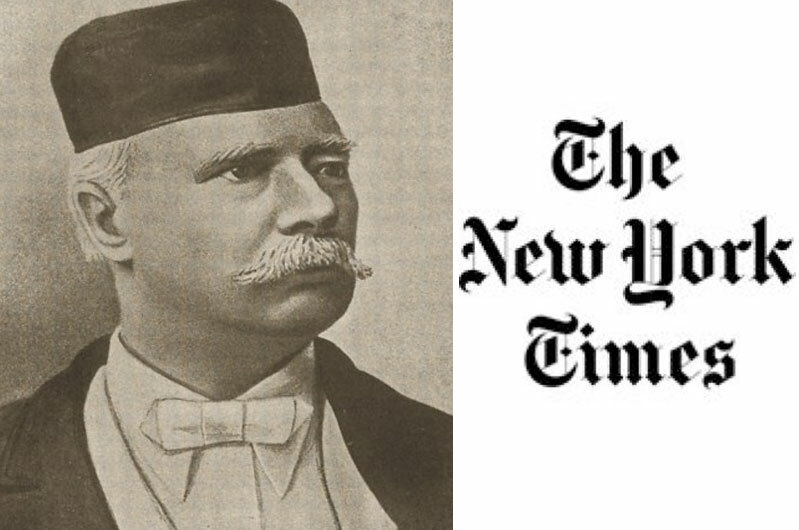 According to a CIA source, “it was indicated that “now” the KGB was in possession of data purporting to indicate President Johnson was responsible for the assassination of the late President John F. Kennedy. In a February, 1976 note, the CIA’s Office of the Director issued a memo which states “Genuine concern has recently been expressed about CIA relations with newsmen and churchmen.” As a result, the agency instituted a new policy not to enter into paid arrangements with these institutions. We then discussed the matter somewhat at more length and I gave ball park figures of various categories of journalists with whom we had contact. I said that the total free lance stringers with whom we had varying degrees of association was in the area of 40. 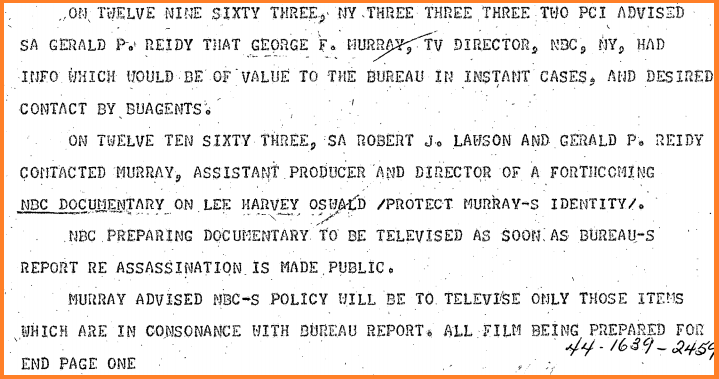 Lee Harvey Oswald – agent of the U.S. government? 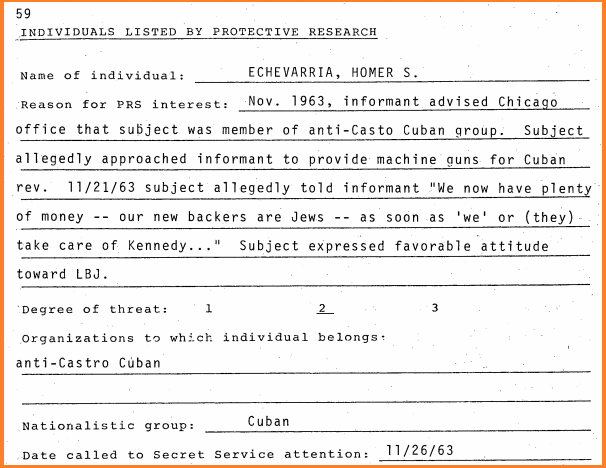 Before reaching any conclusions, note that this is the only claim of Jewish involvement in the assassination aside from Jack Ruby (Jacob Rubenstein), and could be misdirection or scapegoating by Echevarria. That said, The Sun reports that Lee Harvey Oswald and Jack Ruby met each other on a trip to Cuba “to cut sugar cane” weeks before the assassination. They were part of a group of 30 or 40 “hippie looking” people who were on their way to Cuba to cut sugar cane, airport manager George Faraldo told investigators. This bombshell will shed new light on the truth behind JFK’s assassination and whether Oswald was to blame for the former president’s murder. Ruby, whose real name is Jacob Rubenstein, shot dead Oswald, 24, two days after the presidential assassination in November 1963. But just weeks before, Oswald and nightclub owner Ruby were apparently both part of a large group of “mostly young” people heading to Cuba. Mr Faraldo told the FBI that Ruby and Oswald were dressed casually in a sport shirts and trousers.